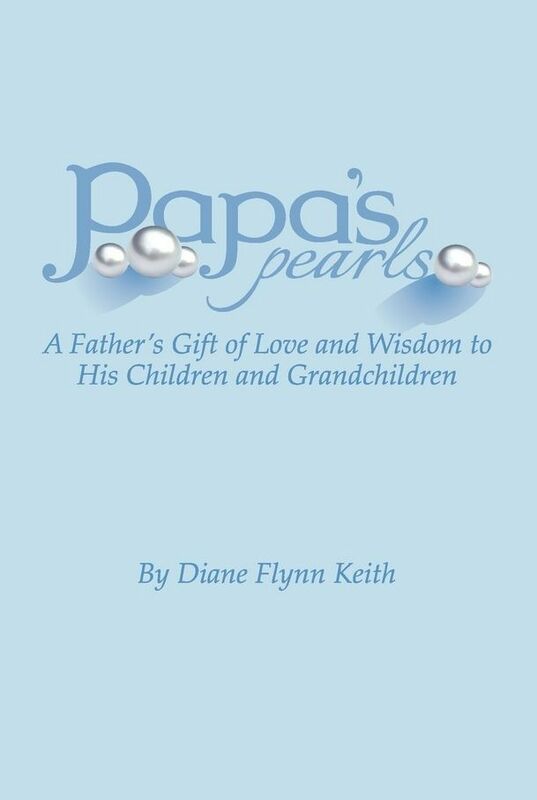 I was recently given a copy of, and asked to read and review, the book Papa's Pearls, a Father's Gift of Love and Wisdom to His Children and Grandchildren, written by Diane Flynn Keith. Papa's Pearls tells of the life of Diane Flynn Keith's father, Papa, from childhood to death, overcoming poverty and crime to become a successful father, husband, and businessman, while simultaneously sharing Papa's "pearls" of wisdom. Each chapter has it's own pearls and short accompanying anecdotes; I was reminded of all those little memes that float around facebook that I see and "must" remember and promptly forget ... except that the addition of the stories behind the "pearls" made sense, and made the little nuggets of knowledge much easier to remember and relate to. The softcover book is a fairly quick read, with 112 pages. It's written for adults, as a parenting and personal growth book, and also worked with my older elementary and middle school aged kids. I read the book first and then passed it along to Mia (age 13) to read in a doctor's office (have I mentioned that the child slammed her thumb in a car door - requiring stitches for the cut AND a splint for the break?). She enjoyed the stories of Papa's life and found a few pearls that spoke to her, particularly one about saving money and one about hugging more (everyone needs a lot more hugs than they're getting!). The book was then passed on to Adam (11) and Kaden (10). In place of their regular creative writing, they were asked to pick a number 1 through 17 (the number of chapters in the book), then read the chapter, choose a pearl from it (they're listed at the beginning of the chapter), and write a page about how that pearl could apply to their lives. Teacher Mama hoped that they'd start reading and read the entire book but they stuck to the assigned chapters. They did do some good thinking, and wrote terrific papers about being honest and trying after failure. I enjoyed the book. The lessons are meaningful, especially as they're presented. Some of the "pearls" really hit home for me, like "Tell yourself you like it" and "Be grateful every day". Some of the anecdotes had me giggling, some had me near tears, and many had me rereading so I'd remember and put into practice the lessons being taught. The boys were very ambivalent about Papa's Pearls. They read what they had to, but really had no interest in digging any further into it. Mia, on the other hand, enjoyed it very much and talked about it quite a bit afterwards, she really did get a lot of out of it, and I can see other teenaged girls really liking it and finding great value in it. Papa's Pearls is available at Papa's Pearls for $14.97 and $7.00 shipping and handling. Click here for more reviews of Papa's Pearls from the Schoolhouse Review Crew.